A happy dog is a well behaved dog – regardless of its age or breed. Exercising your dog is important, both mentally and physically. Keep your dog happy with our list of resources, jam packed with advice and tips on training, socialisation & playing games with your furry friend. And if you and your dog are looking for some like-minded friends to hang out with, you might like to try some of the meet-up groups and online forums for dog lovers suggested below. If you have a puppy and are interested in information and advice specifically aimed at pups, please click here to download our Puppy Guide e-book. This list is continually growing and being updated. If you feel like we are missing some information or have a link that’s worth adding to add to our list, please let us know. We often wonder why our dogs do some of the strange things they do, for example their habit of smelling every car tyre and every tree. Or why they eat grass and sniff each other’s butts! This article explains where some of these wonderous dog behaviours stem from. This article helps to decode 10 of the weirdest dog behaviours and tells you why your pooch enjoys them so much. Great infographic on how to decode what your dog is telling you through body language and vocalisation. And what you can do to respond to it. This article is an interesting read for the dog training nerd in you discussing the theory of ‘Errorless learning’ versus the use of ‘No reward markers’. Interested in learning theory? This is a great article about how learning from our animals and the golden rule of ‘Be open, receptive and allow animals to teach you’. This article gives you a good overview of obedience training for your dog, what to do and why it is so important. 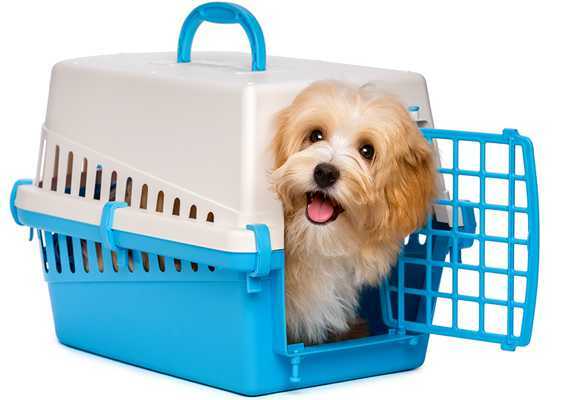 Crate training your dog can be very helpful for toilet training and general management of your dog. This article teaches you how to crate train your dog. Socialising your pet is never too late and of upmost importance. But take it easy on your new rescue dog – our rescue dog guide has a few great tips for you. Comprehensive article around how to introduce a new dog into a home which already has other dogs. 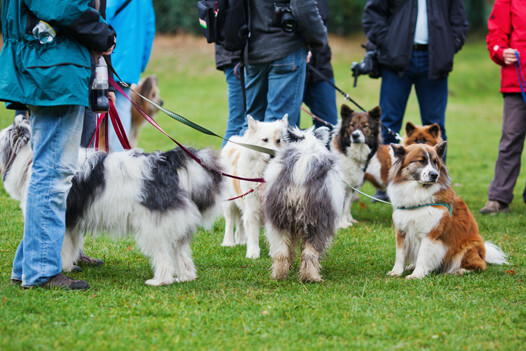 In 10 easy steps the author describes how to safely introduce your dog to another dog. Short article explaining the importance of socialisation and how you can socialise your puppy even before it has had all its vaccination shots. Under the headline ‘Socialisation matters: Don’t let the clowns eat your puppy’ this article explains why socialisation is so important and how it can be done. Socialising means meeting and having pleasant encounters with others. Puppies should become accustomed to a wide range of events, environments, situations, people and animals. This article gives you some great tips on how to socialise your puppy. This article gives you a short introduction on puppy socialisation. Make friends for yourself and your dog – join the NSW Dog Lovers Group. This group has over 500 members. Must Love Dogs – With more than 900 members this is group is well established in Melbourne. Looking for a playmate for your small dog in Brisbane and surrounding areas? Then this is the perfect group for you. The Dog Forum is a community of dog lovers where you can discuss dogs and puppies, get answers to your dog questions, help out others and participate in dog chat groups. Dogsey is a very active site with a whole list of forums including a forum for dog owners over the age of 50. With more than 80,000 members and over 1,600,000 posts, Dogforums is a very active community where dog lovers help other dog lovers. A lost pet is a dramatic event that is every pet owner’s worst fear. This article gives advice on how to prevent your dog from getting lost in the first place. Spring time is cleaning time and here is the ultimate spring cleaning checklist for dog parents. 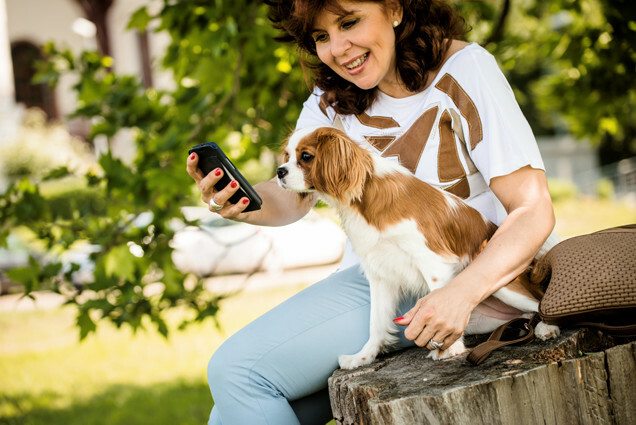 Our top ten mobile apps every dog owner should have on their phone. Finding a lost pet: Together with the Whistle GPS Pet Tracker, this app will help you to locate your pet using GPS and your phone. This app will help you easily to find out if a food is good or bad for your dog. Best feature: you can save your favourites! First Aid for Pets Australia is an educational tool that contains many helpful and potentially life-saving articles for quick reference in the event of an emergency or potential health risk for your pet. Ever wondered what your pet is up to while you are out of the house? The iCam app allows you to remotely monitor multiple live video and audio webcam feeds from your mobile device. Take the best possible care of your furry friend – track all your walks, each meal & all your dog’s business. Share important info with fellow caretakers. BuzzFeed presents ‘Cute or Not’, a photo app for the animal lover in us all. ‘Cute or Not’ lets you swipe right to discover and share your favourite animals. Is it raining, too hot or are there other reasons you can’t get out to walk your dog? Check out these 9 ideas of how to exercise your dog without taking it for a walk. Indoor agility, tricks and games and dog puzzles – find more ideas here on how to exercise your dog indoors. 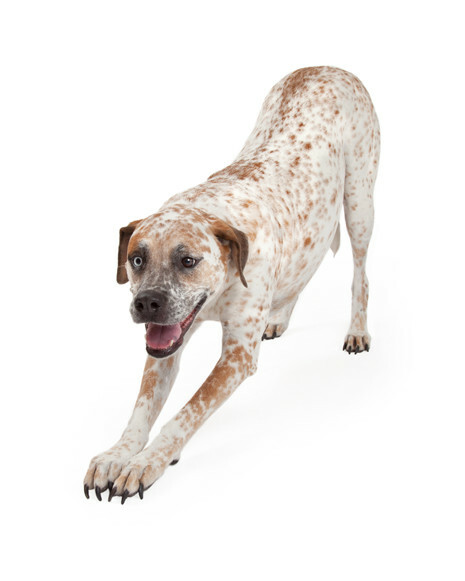 Warming up muscles is as important for dogs as it is for humans before any sporting activity – here are 9 great ideas. Do you love running and want to take your dog with you? This article sharing 10 helpful tips around running with your dog. Leash, foldable water bowl, harness … just to mention a few of the list of 20 must-have gadgets for exercising with your dog. 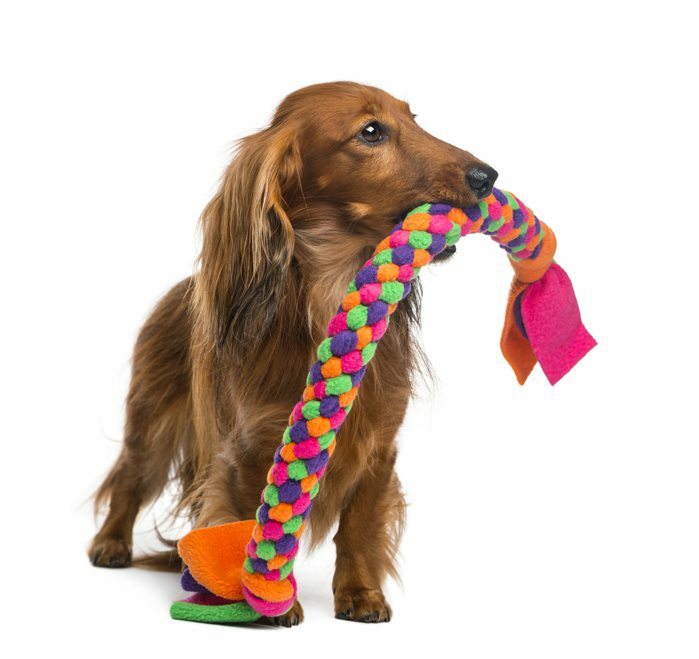 This article features a selection of 6 treat dispensing boredom buster toys for your dog. Finding the right leash for your dog isn’t easy. This article talks you through your options. Dog collar or dog harness? This article helps to bring a tired pair of denim jeans and a not-so-tired dog together. This simple no-sew DIY dog toy is not just easy to make but also great entertainment for your pup. Recycling your old shirts or pants and giving them a new purpose can be easy with this no sew dog tugga toy. Shirts, tennis balls, socks, cardboard boxes – the list of ideas is endless. This article gives you a whole range of ideas on how to recycle old clothes or household items into toys for your dog. 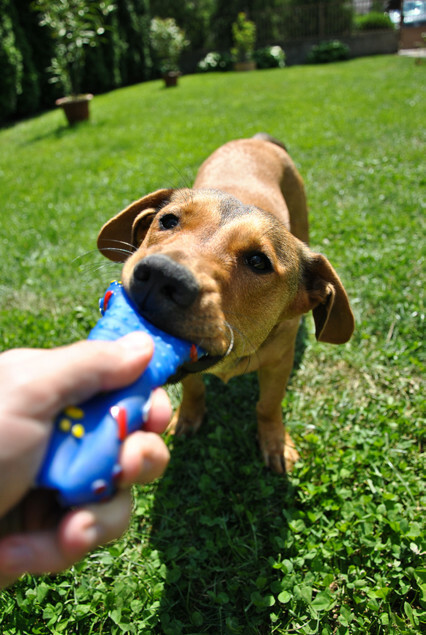 Dog toys aren’t cheap; luckily here is a list of 10 of great DIY dog toys you can make yourself. What a creative idea: make a unique dog bed out of an old suitcase! This article explains how. For the trendy dog – Check out this DIY Tutorial on how to make your own reversible dog bandanas. DIY guide on how to make your own dog bed out of a sweatshirt and a pillow. Check out this great idea for an elevated DIY dog bed with storage. It’s genius. What a fantastic idea is this dog feeder made out of a old wooden soda box. Totally vintage and totally beautiful. Good old Hide & Seek, Treasure Hunt, Tug-O-War, Targeting and Shaking The Paw – this article explains how to play these five games with your dog. Brain games are a great idea to keep your dog’s mind occupied and bond with your dog at the same time – this article shares 10 great ideas with you. Flirt pole and water hose are just 2 games you can play with your dog. This post shares 5 ideas for you and your dog to spend some quality play time together. It’s never too late to play with your dog and teach your dog new things. Here are some great ideas for games to play with your older dog. 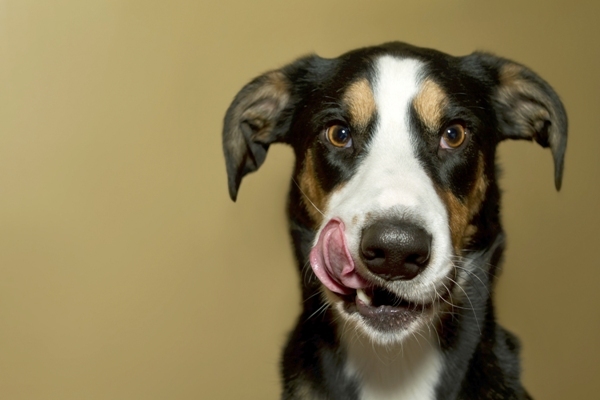 Try these great boredom busters to keep your dog entertained and occupied indoors.